Today marks one week since I started this last leg of the voyage from Piriapolis, Uruguay. It has been generally slow going, with the prevailing NorthEast wind making for mostly upwind sailing, frequently in fairly light air. I have been striving to get around Cabo Frio- just East of Rio de Janeiro- and the large group of oil rigs that are just off the coast. I still have about 150 miles to go to be truly past the oil rig farm, and I have about 1,100 miles to the "Bulge of Brazil" and the turning mark at Recife. Unfortunately, I think it will continue to be slow going, with more upwind, light air sailing, forcing me to sail extra miles in a saw-tooth course up the Brazilian coast. I will continue to try to stay offshore to avoid all hazards and be better able to sleep. 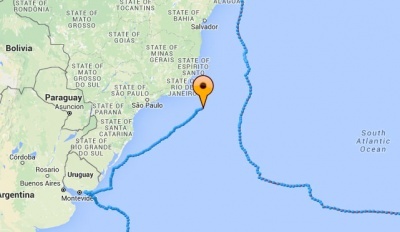 I have also been experiencing the "Brazil Current"- which is a southerly flowing current that goes along the continental shelf and seems to be about .5 to 1.0 knots in strength. So not too bad, but doesn't help when you are only going 6-8k and not quite in the right direction. Someone described sailing North up the coast of South America against the prevailing wind and current as an "interminable" experience, and I am beginning to see what they mean! Right now everything is good on the boat, and I am grateful we were able to repair all the damaged gear in Uruguay. Having the second auto-pilot back means I can dial-up the sensitivity a bit and the boat is steering better. The replacement Solent jib is great- and we were also able to replace the broken halyard and halyard shiv block in the mast for the staysail, so I have the use of both the Solent and staysail jibs. Before I stopped, I no longer had the use of either of these jibs, so all this upwind work without a decent jib would have been much slower and very frustrating I'm sure. All the winches are spinning nicely and the watermaker is glued back down and working well- the engine, hydros and solar are keeping the batteries nicely charged- and of course the repairs to the hull delamination in the bow and the addition of the two new longitudinal stringers are holding up well to the upwind pounding. The weather has for the most part been sunny and warm- which has been very pleasant- although it is now getting downright tropical- so I find myself seeking shade and hiding from the intense sun. I pass the long hours alone by reading books, writing and watching movies- just finished "Red Dragon" by Thomas Harris, the first in the Hannibal Lecter/ "Silence of the Lambs" series, and it was quite scary! I am a bit short on entertainment, so have been communicating by email with friends and family, which helps a lot.